Sat., Mar 31, 1917 Forward Hdqrs. Ross St. S27d4.3. 3.12 A.M. On the night of 30/31st. 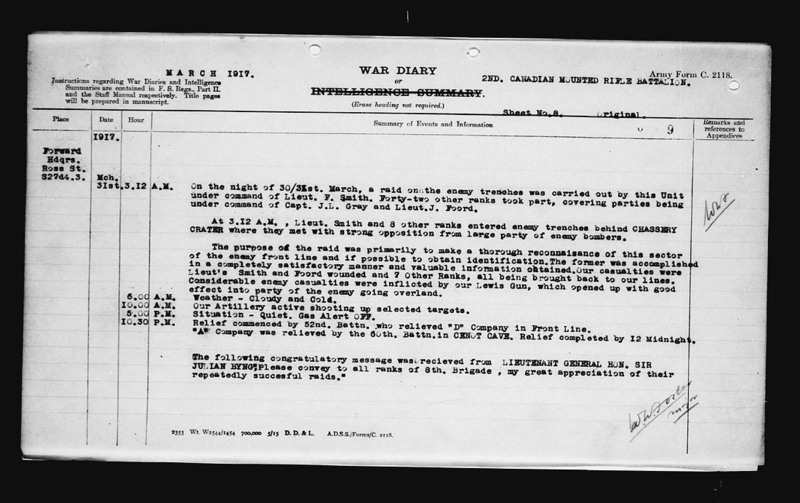 March, a raid on the enemy trenches was carried out by this Unit under command of Lieut. F. Smith. Forty-two other ranks took part, covering parties being under command of Capt. J.L. Gray and Lieut.J. Foord. At 3.12 A.M. , Lieut Smith and 8 other ranks entered enemy trenches behind CHASSERY CRATER where they met with strong opposition from a large party of enemy bombers. The purpose of the raid was primarily to make a thorough reconnaissance of this sector of the enemy front line and if possible to obtain identification. The former was accomplished in a completely satisfactory manner and valuable information obtained. Our casualties were Lieut’s Smith and Foord wounded and 7 Other Ranks, all being brought back to our lines. Considerable enemy casualties were inflicted by our Lewis Gun, which opened up with good effect into party of the enemy going overland. 6.00 A.M. Weather – Cloudy and Cold. 10.00A.M. Our Artillery active shooting up selected targets. 5.00 P.M. Situation – Quiet. Gas Alert OFF. 10.30 P.M Relief commenced by 52nd. Battn. who relieved “D” Company in Front Line.